The cold is a common viral infection that affects most adults at least 2-4 times a year. It can be caused by over 200 different types of viruses and comes with a number of distinct symptoms. 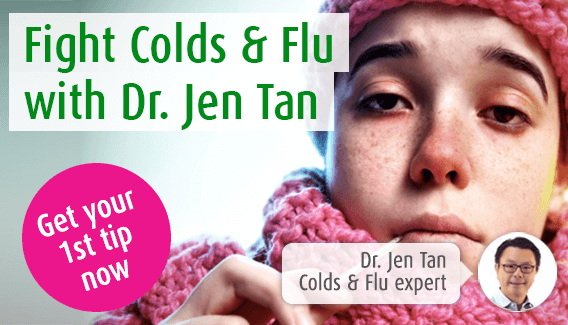 Here at A.Vogel Talks Common Cold, our immune system expert Dr. Jen Tan shall be exploring the causes and symptoms of the cold as well as recommending the best herbal remedies available. You can also use our Q&A service to ask Dr. Tan a question about the common cold. It is said that the cold is also known as the common cold because it is such a common illness. Most people will catch two to four colds a year - and they are much more frequent during the winter months. Some people use the term ‘head cold’. This is simply the common cold which affects the nasal passages and sinuses more intensely than normal. Follow the link to find out more about head colds. Cold viruses entering our body attach themselves to the soft, warm surfaces of the nose, throat and sinuses and hence, this is where symptoms of the cold normally start. The first symptom is often an irritation, itch or soreness in the throat. However, a range of other symptoms may be experienced, from a blocked nose to sweating. Typically, symptoms of the common cold appear within one or two days after you have been infected by the virus and can last for up to a week. Generally this doesn’t lead to any further complications, but there is a range of medical conditions which may arise as a result of your cold. The common cold can be caused by any one of around 200 different viruses. If you are infected by one of these, your immune system triggers a response to fight the infection. This causes inflammation and the cold symptoms we are all familiar with. Viruses causing colds can be found in many places, ranging from droplets in the air to escalator handrails. There are certain hygiene measures you can take to reduce your exposure to these viruses, such as washing your hands regularly. Read more about causes of the common cold. What remedies are there for colds? A range of home remedies have been used for years to treat colds, including the traditionally Scottish hot toddy or the somewhat humbler glass of water. Antibiotics, which treat infections caused by bacteria, are not effective against the common cold as these are caused by viruses. This is the reason doctors are reluctant to prescribe antibiotics even for severe colds, unless there is an accompanying bacterial infection. Read more about cold remedies. The effects of a head cold or common cold have been described in Egyptian papyruses written before the 16th Century BC. In the 16th Century AD the term ‘common cold’ came into play as the symptoms were similar to those of being outside in cold weather. In 1956 the rhinovirus was discovered, and was understood to be a cause of the cold. Nowadays, about 28 million working days are lost a year because of the cold, resulting in an estimated loss of £1300 million every year. Not to mention the fact that, on average, £100 million is spent every year on OTC cold medicines. Colds are not usually considered to be serious illnesses and most people either ignore the problem or treat the condition with cold remedies containing pain-killers or echinacea. Only 5% of people in the UK visit their doctor for help with the common cold. However, some people need to take extra care. Those suffering from asthma, chronic bronchitis and people with a weakened immune system may need extra support and attention. The very young or the elderly may also find that their immune system is not strong enough to fight off infections. Seek medical advice if you think you may have developed a complication as a result of your cold. As with any illness, consult your doctor if you are worried or in doubt.